[Monday 16th December]: Yesterday saw the grand final of the seventh annual Eukanuba World Challenge and the crowning of Ch ‘Afterglow Maverick Sabre’ – or Ricky to family and friends - as “Eukanuba World Challenge Champion 2013”. Hosted at the 13th annual AKC / Eukanuba National Championships in Orlando, Florida, the prestigious Eukanuba World Challenge saw 43 elite dogs from around the world – each representing their respective countries after having previously won a local qualifying event or BIS at a major dog show – compete against each other for the highly coveted title of “Eukanuba World Challenge Champion 2013” and $10,000 prize money. 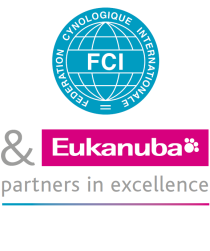 Representing the UK, Ricky qualified for the event in October this year as winner of the Eukanuba Champion Stakes. He was bred in the UK by Michael Gadsby and Jason Lynn, who is also co-owner along with John & Sandra Stone. Ricky has had a very successful year, including winning ‘Top Dog All Breeds’ in the UK as well as winning ‘Best Bred By’ in the non-sporting group at the AENC on Saturday. The 43 competing dogs from 38 countries were split into four non-geographical groups judged by: Hungarian Kennel Club President Mr Andras Korozs; top handler and respected judge Mr Peter Green; Dutch Kennel Club President Mr Gerard Jipping; and former President of Israel's Kennel Club Mr Zvi Kupferberg. Just three from each group went through to the grand finale held on Sunday and judged by Mr Martínez, in which ‘Afterglow Maverick Sabre’ was crowned World Champion. Runner up was Dogo Argentino ‘Monika de Don Eloy’, who qualified as the winner of the FCI Americas & Caribbean Section Show. Bred and owned by Lilian Colantonio from Argentina, Monika was handled masterfully by professional handler Agustin Farias, winning the $3,000 prize. Proud owner Lilian believes Monika was born to be in the ring and who can blame her, having already achieved 32 Best in Show wins, 37 Best of Group wins and 108 Best of Breed wins. First runner up, winning $2,000, was Dobermann Ch ‘Protocol's Veni Vidi Vici’, representing the “Best of Bred by” winner of the AENC 2012. ‘Fifi’ is bred and owned by Kevin and Jocelyn Mullins who handled her expertly to this and many other past successes, including 75 Best in Shows, 3 consecutive National Championship wins, and 52 Best in Show Specialty wins. Jocelyn, who happened to celebrate her birthday on Sunday, was over the moon about achieving this fantastic result, “It’s unbelievable to be among the top three dogs in a competition comprised of only winners - the best of the best”.